From Wikipedia we learn that Abraham Maslow suggested in 1943 that there is a priority level for each of our needs. He first introduced his concept of a hierarchy of needs in his 1943 paper “A Theory of Human Motivation” and his subsequent book Motivation and Personality. According to him, once the basic needs of survival are met, the next level of needs come into play. While not everyone agrees with all of the elements of each level, the Hierarchy of Authority still stands as a description of human needs. While some have modified his position, the hierarchy does help us to understand how people function. 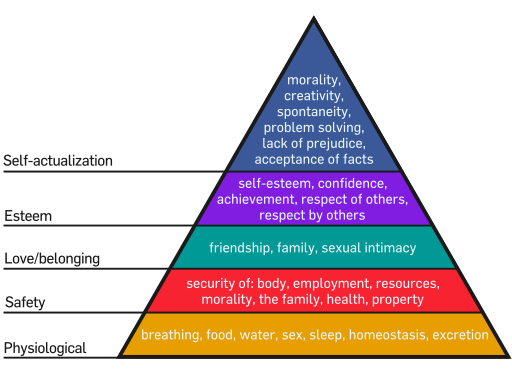 Maslow illustrated human hierarchy of needs in the form of a pyramid. Previous It’s 2016. Do You Need Jesus To Do It All Over Again?